FitnessRX for Women > Nutrition > Supplements > FitRx Reviews > Eat-Smart Bars! I am very busy and am always looking for healthy, but nutritious, on-the-go snacks. Between meetings and writing and editing all day long, I need a snack that I can grab quickly in the morning and have available when I have a second to enjoy it. So for this reason I love protein bars because they are so convenient. The problem is finding one that’s not loaded in sugar and sets me back in my fitness goals rather than moving me forward. 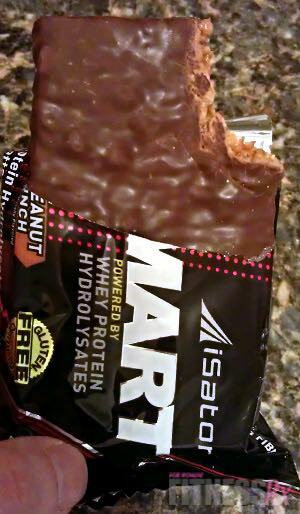 I didn’t try iSatori’s Eat-Smart bars until recently, but was very excited to add a new bar to my snack list. According to the package, the bars had zero trans fats, low sugar alcohols, a high-fiber content, and were delicious. So I was intrigued, but skeptical at just how delicious they really were. The flavor I tried was Chocolate Peanut Caramel Crunch. At first, when I was reading the label, I thought, OK, that sounds too good to be true. Chocolate, peanut butter and caramel are all things I love, but cannot have all the time for obvious reasons (i.e., I’m trying not to counteract all my hard work at the gym). But I took one bite and I could not believe I was eating a protein bar. Yummy! Sweet, crunchy and tasty! The crunchiness was something different from other protein bars, and it was so good I almost felt like I was eating a candy bar! I had the bars several times that week for snacks either in the late morning or afternoon. I was pleasantly surprised to find that the bars filled me up enough to hold me over until lunch or dinner. Also, they are GREAT for when I’m craving sweets at night, satisfying my sweet tooth without any guilt! Now I’m really interested in trying the Frosted Cinnamon Caramel Crunch flavor… yum! Many protein bars contain gelatin (which is made from cow’s hooves) because when tested in a lab, it shows the proper nitrogen levels for a protein, allowing it to be labeled as such. In actuality, it is a very weak source of incomplete protein (for instance, Jell-O® is almost 100 percent gelatin, but if you check the protein content on the box, there is almost none). As a result, some supplement manufacturers use gelatin as a secondary protein in order to save money on ingredients and moisten the bar. The other great about these bars is that they are 100 percent free of trans fats! In fact, half of the fat in these bars comes from real, roasted peanuts— and those are the healthy fats that we want! Aside from that, the remaining fats come from oils used to make the bar moist, chewy, and to serve as a natural preservative. 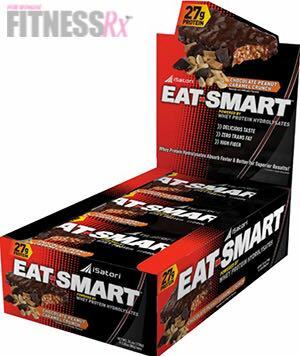 The 45-gram Eat-Smart bar with 15 grams of protein is a convenient size for a snack, and there’s also a larger version of the bars that contains 27 grams of protein. I tried this size too. Sometimes, I only needed half as a snack because they were so filling; and sometimes these even were enough for a meal replacement! If you are like me— always on the go, need energy for your busy days, but are watching calories— then I recommend you try these bars. Rich in protein and taste, but not rich in all the bad stuff! The perfect combo. Visit iSatori’s Facebook page at facebook.com/isatoitech, or their website at www.isatori.com.